The Opera browser for Android has just been enhanced with a feature that should interest a large number of Android users. Indeed, the Norwegian company has chosen to add a free and unlimited VPN to its browser. Opera is not at its first attempt in the VPN world. The desktop browser already has a free VPN and is fully integrated into the browser settings. On mobile, the Norwegian publisher also offered a VPN application for Android and iOS before abandoning it last year. Opera's VPN comes with version 51 of the browser. It is very easily accessible and the user does not need to create a user account to use it. He can choose from a list of servers that communicate with the user's smartphone using 256-bit encryption, which ensures the confidentiality of searches and sites visited. Why did Opera choose to add a VPN to its browser? The company could use this argument to target a niche of users who need it on a daily basis on Android. The latter could still be wary of the free service, which is often synonymous with the use of data. 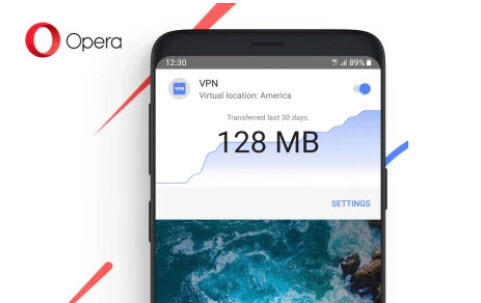 Jan Standal, vice president of product marketing at Opera, said that the VPN service "is provided free of charge as a unique feature to improve privacy and security". He also adds that "unlike other VPN services, Opera does not depend on the monetization of the browser's VPN service". If you want to test the VPN integrated into Opera Android, please be aware that update 51 is being gradually deployed worldwide as this article is written. UFO VPN is a VPN software that allows you to protect your privacy, easily access geographically blocked content and choose your virtual location.